The ongoing market turmoil, the bankruptcy of Lehman Brothers leaving $65 Billion in frozen hedge funds assets, and the doubts surrounding the leading primes have accelerated the demise of the already faltering single prime brokerage model. Single primed funds that had been slow to embrace the new multi-prime world are now highly motivated to reduce counter-party risk by establishing multiple custodial relationships. This guide explores the different options available to a single primed fund that is making the leap to multi-prime. It begins by describing the nature of the operational challenge, then weighs the pros and cons of today's multi-prime solutions, and concludes with a recommendation. Once a fund accepts the necessity of multiple prime relationships there quickly follows the realization that there is a cost associated with this new model. This cost, which is in the form of operational complexity and the need to acquire middle and back-office functionality, had been borne by the prime in the single prime model. At the very core of this complexity is the requirement to collect and aggregate the disparate cash, position, and transaction information, across multiple primes. Once the data are captured and reconciled the fund must then be able to present the data in real-time and historical, views and reports, which allows the fund to understand key measures such as P&L, performance, exposures and risk. Additionally, since the data are so critical to so many constituencies it must be flexible enough to meet the specific needs of everyone across the firm. Likely users include the trader, the portfolio manager, the compliance officer, the COO, the CFO, Operations and indeed ultimately external investors. Further complicating matters is the certainty that as the expanded search for alpha continues to drive funds far beyond their domestic long/short equity roots, the middle and back-office must now be capable of handling multi-currency, global securities, and derivatives, all across multiple time-zones. Much consideration must be given to how a firm deals with this operational challenge since many of the available solutions involve a fund going in a direction that risks distracting them from their central purpose of alpha generation. At the heart of all multi-prime solutions is the portfolio management system (PMS). Before we explore the attributes of the multi-prime PMS let's briefly look at the three key building blocks necessary to ensure that the PMS displays relevant, accurate and timely data. 1 - Allocation - An effective allocation process ensures that the PMS has the ability to 'slice and dice' views and reports in a manner that is sufficiently flexible to meet the information needs of the particular end user. At the highest level it involves a process of identifying and categorizing trades down to the tax-lot level. Once these positions have been correctly categorized it becomes possible for the PMS to generate reports based on these categories. More sophisticated allocation methods allow for a layered approach so that reporting can be multi-leveled. An example would be a CFO who would like to understand the P&L attributed to a particular portfolio manager, who is associated with a specific strategy within a particular fund. The data can be quickly viewed assuming that the allocation has been correctly completed and that the PMS is capable of this multi-tiered reporting. Allocation is usually handled by an Order Management System (OMS). It is vital that the OMS and PMS share the same allocation methodology or the reporting flexibility of the PMS will be compromised. 2 - Data Capture - The subject of data capture becomes particularly important in a multi-prime environment. The data that the PMS displays will only be as good as the quality and the timeliness of the information flow between the relevant counter-parties. It is imperative that the solution can send and receive the file formats demanded by primes, fund administrators, executing brokers and market data vendors. Formats such as flat-file, XML, SWIFT and increasingly FIX are prerequisites for any modern solution. To further complicate the process, a robust security master must be at the core of the data capture process. The security master ensures that data across multiple primes is normalized so as to allow seamless integration. In addition, a security master that includes independent corporate action verification will serve as a check and balance to the primes’ corporate action reporting. 3 - Reconciliation (and Exception Processing) - The reconciliation process ensures the accuracy of the firm's data and involves the fund comparing what it understands to be its trading activity with the records of other counter-parties, such as the primes or the fund administrator. Ideally the process is automated and ensures that differences or exceptions between the various parties are discovered and corrected as soon as possible. Once these errors are discovered the PMS should have the ability to unwind the error in a one-step process. The PMS has always been the most important hedge fund application because it is responsible for generating its books and records. This queryable repository of a fund's activity is used as a tool to understand how successful a fund's alpha generation efforts have been in terms of performance and risk, and is critical in a multi-prime environment. It is no surprise that the evolution of the PMS has mirrored (and in many cases lagged) the evolution of the hedge fund industry. The first hedge fund PMSs that emerged 20 years ago were essentially re-purposed vendor solutions from the long-only asset management industry. As funds push beyond domestic long/short equity strategies these same vendors have responded, with varying levels of success, by grafting on the functionality required to support multi-currency, multi-market and multi-asset class. Arguably, the biggest demand placed on the PMS by this new complex multi-prime world, and the demand that legacy systems most struggle with, is the requirement for true real-time views of data. Funds today require a real-time understanding of their strategies' performance and risk. This is particularly true in light of today's market volatility. Alpha has become increasingly fleeting in nature and funds now must be able to respond instantly to changing market conditions. Many legacy systems struggle with this real-time requirement because their architecture pre-dates the widespread adoption of the FIX protocol. To understand this we only need to look at how FIX has dramatically increased the flow of trading information into and out of the front-office. This urgency of information flow is now making its way to the middle and back-office. Legacy PMSs that were built in a "T+1" world cannot reflect the real-time effect of trade execution on performance and risk because they cannot accept FIX messages. Only a PMS built around a FIX engine can offer data that is updated both tick by tick and execution by execution. 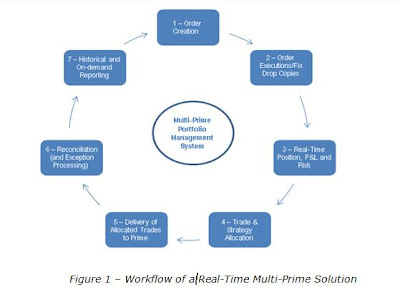 Various industry players have sought to offer a solution to the operational burden of multi-prime. In choosing one of these solutions, funds typically face a tough trade-off, which at its most basic level involves a choice between cost and control. Hedge funds that do not have the financial and human resources, and are willing to live with less control typically choose a less costly outsourced solution. Funds that have more resources and demand complete control of their data take the time and expense to build-out an onsite system. Let's look at the four most popular solutions available today. 1. Prime Broker (Outsourced) - "Hearsay Reporting" - Hearsay reporting is when one prime (usually the original prime) agrees to accept and aggregate the trading files from other primes on to their reporting platform. The advantage to this approach, from the hedge fund's perspective, is that the original prime shoulders all the operational complexity of going multi-prime. Not much changes for the hedge fund. They continue to receive their familiar reports but now including an aggregated view of all their relationships. There are, however, a number of significant drawbacks to this approach. First, not many primes are willing to play the role of "the prime of primes". Primes that offer this service will weigh up whether retaining a now smaller portion of a fund's business is worth taking on the cost of the very manual task of hearsay reporting. Anecdotal evidence suggests that the top tier primes are not willing to offer this service unless a fund has at least $1 Billion in assets. Additionally, as the fund adds more and more primes the original prime will find it less compelling to offer the service. Second, hearsay is a very manual process and is only as good as the data received. Factor in the possible resentment of the prime offering the service it is not surprising if accuracy suffers. Third, hearsay does not sufficiently reduce a firm's dependence on a single prime. Any problems associated with the prime offering the hearsay reporting will mean that the fund will have to scramble to replace their reporting infrastructure. Finally, this solution only goes part of the way to solving the reporting problem. This is because most hearsay solutions rely on legacy PMSs that are based on a T+1 process and therefore cannot offer a real-time understanding of P&L and Risk. Mini-Prime Broker - A subcategory of the Prime Brokerage industry is a group known as the Mini-Primes. They typically use the clearing services of larger institutions and traditionally served the funds that the bulge-bracket primes deemed to be too small or risky. Their value proposition has been around better service at lower cost for the little guy. The turmoil surrounding the leading primes has meant a mass exodus of many smaller funds towards these mini-primes. Some of these mini-primes offer relatively robust hearsay reporting. They, however, suffer from many of the drawbacks of their larger brethren. 2. Fund Administrator (Outsourced) - "Middle and Back Office" - The fund admin would appear to be the obvious candidate to provide a multi-prime aggregation service. After all, traditionally the admin is responsible for aggregating all of a fund’s activities to produce monthly financial statements and NAV calculations. Indeed, many fund admins have moved in the direction of offering outsourced middle and back office services. To date, however, these offerings have not been met with great enthusiasm from the hedge fund community. The typical complaint is that the reporting provided by the admin is just not flexible or timely enough for many hedge funds. The reason for this is that the vast majority of admins rely on the legacy portfolio management systems mentioned above and therefore struggle with flexibility and in particular the ability to offer true-real time P&L and risk. Finally, and a not to be underestimated factor, is that there exists a cultural mismatch between the accounting mindset of the fund admin and the trading mindset of many of the hedge funds they seek to service. 3. Microsoft Excel (Onsite) – Some firms attempt to overcome the operational complexity of multi-prime by using Excel. This is particularly true for firms that relied heavily on Excel to augment the reporting capabilities offered by their original single prime. It is true that Excel is a very flexible tool but there are many drawbacks to this approach. One, quite simply, the days of an investor willing to write a $50 million check to a fund that has no formalized infrastructure are long since gone. Investors now spend almost as much time doing operational due diligence as they do research into a firm’s risk and return profile. Two, Excel is not built to handle real-time decision making. Three, funds that delay implementing a viable long term solution will find that Excel becomes engrained in their workflow and that over time more and more internal resources will be expended just to maintain this sub-optimal solution. 4. Legacy (Onsite) - For ultimate control of their multi-prime data a fund typically feels that their only option is to acquire an onsite PMS, OMS and increasingly an execution management system (EMS). This comes at a considerable cost and usually involves hiring a team of technologists to implement, integrate and maintain these disparate legacy systems. With all this a fund may still find that the data that they demand are still elusive and that a considerable amount of time has been wasted in building a competency in technology when the firm’s primary focus should have been alpha generation. Nirvana Solutions’ purpose built approach for hedge funds dispenses with the usual trade-off between cost and control, by combining the best attributes of the outsourced and onsite models. It involves a single integrated solution that includes a real-time portfolio management system built around a trading engine, all made available through the Software as a Service (SaaS) deployment model. It places the FIX enabled portfolio management system at the very heart of all of a hedge fund's activities. This single real-time database architecture ensures that everyone in the front, middle and back office shares access to the same real-time and historical information displayed in a form specific to their role. Furthermore the SaaS model ensures that a firm’s focus remains on alpha generation and not on IT support. The credit crisis has brought home to the hedge fund community the risks associated with the captive single prime broker model. As funds embrace the world of multi-prime they are discovering that the accompanying operational burden must somehow be addressed. There are a number of competing solutions available to this problem, funds however, must realize that the capabilities of these solutions vary greatly, particularly in terms of their ability to offer true real-time views of P&L and Risk, and in the amount of IT support required. Both of these factors are now critical in this new era of increased volatility and depressed returns. Article contributed by Peter Curley of Nirvana Solutions. Peter is a founding managing partner at Nirvana Solutions. His areas of responsibility include managing all of Nirvana's marketing activities as well heading their west coast sales team. Prior to joining Nirvana Solutions, Peter was the product manager for Advent Software's order managment system (OMS), Moxy. He oversaw all the product marketing activities for Moxy, which is used worldwide by over 800 firms. He had a special emphasis on trading and hedge funds and has authored a number of articles and whitepapers on these subjects. After business school Peter joined IBM's Strategy and Change group as a strategy consultant. He was attached to IBM's Financial Services arm and completed a number of strategy assignments at major Wall Street firms as well as smaller start-ups. Peter began his career as a registered representive at Charles Schwab and was a team lead for the introduction of Schwab's innovative e.Schwab electronic brokerage offering. He later was involved in the development of Schwab's active trader application, Velocity, which was merged with CyberTrader. Peter holds a bachelor's degree in economics from University College Dublin, a Master's from University of Exeter and an MBA from Columbia Business School.